Months ago the scanner died interrupting my weekly “Sunday Painting” feature. I am happy to say the scanner has been replaced and the show can go on. I wasn’t sure what I was going to post this week for the return of this venerable institution, but last night I watched Tony Palmer’s documentary on Benjamin Britten, “A Time There Was”. 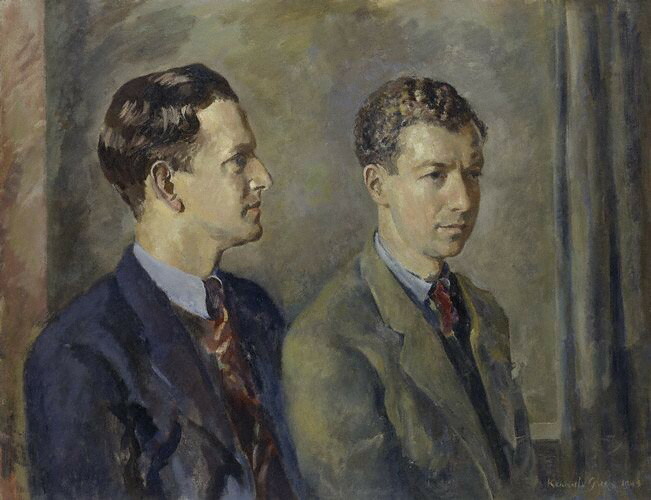 I have long been a fan of composer Benjamin Britten, his life partner and tenor Peter Pears, and this touching painting of the two of them from 1943. Watching this documentary last night reminded me of Britten’s brilliance and the brilliance of their professional partnership. It also gave wonderful insight into the deep and loving personal relationship they maintained over 40 years. And this 67-year old portrait of a prominent gay couple is nothing less than a revelation. What a beautiful painting that depicts a long term partnership and relationship. I love this feature of your blog. I've always appreciated art, but haven't ever really known much about it. I've decided to change that! Thank you for the reccomendations for Monhegan. I'm working on planning a trip for next year–probably September! Kathleen: Even back in 1989 when I first saw this painting it seemed like such a statement. Thankfully it seems less so these days unless you think of when it was painted. Aside from the political dimensions, the depiction of the couple is quite sweet I think. Marianna: I am glad you like it. I don't know much about art either, but I do have a big collection of postcards that I have collected over the years of paintings that I have liked. And speaking of art, you probably know that Monhegan is an artist colony in the summer so you will see lots of art there. Unless it is a calm day you may want to take a dramamine before you hop on the ferry to Monhegan. I learned that one the hard way.